Bus from KLIA to Ipoh or bus from KLIA2 to Ipoh is one of the popular bus services in both KLIA and KLIA2 airports. After landing at the airport, many locals (from Ipoh, Taiping, Bidor, Tapah, Kampar and Gopeng areas), as well as foreign tourists who are planning to visit the mountain city Ipoh, would prefer to take direct bus from KLIA/KLIA2 to Ipoh without making a transit in Kuala Lumpur city. This is because bus from KLIA/KLIA2 to Ipoh offers great convenience and time-saving advantages to locals and foreign tourists. Star Shuttle Express is the only reputable operator serving bus from KLIA to Ipoh or bus from KLIA2 to Ipoh. Star Shuttle coaches are equipped with spacious seats and air-conditioning systems to ensure their passengers’ comfort during the journey. Moreover, Star Shuttle also offers Wifi and power sockets onboard for business travellers and leisure uses. There is a total of 8 schedules daily provided by Star Shuttle for bus from KLIA/KLIA2 to Ipoh, starting as early as 5:45am and as late as 2:00am after midnight. After landing and customs clearance, passengers who have booked tickets online in advance can proceed to the KLIA coach bay and KLIA2 coach bay for checking in and boarding. The travel duration for bus from KLIA to Ipoh or bus from KLIA2 to Ipoh is about 3.5-4 hours depending on the traffic condition. Coaches will first depart from KLIA2, then proceed to KLIA to pick up passengers, before heading to Ipoh. Starshuttle provides a drop off at Aman Jaya Bus Terminal. 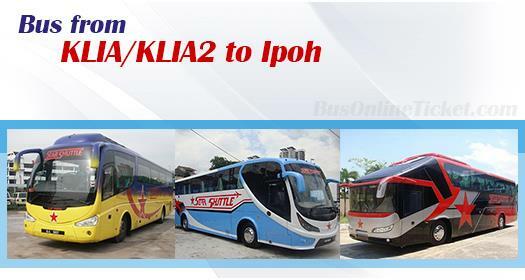 The direct bus service from KLIA/KLIA2 to Ipoh is convenient and time-saving for passengers because they can save the hassle of shuttle transfers and transit waiting time in Kuala Lumpur city. Besides that, by avoiding going into Kuala Lumpur city, it spares the passengers from the heavy traffic in Kuala Lumpur. As a result, even if the bus fare (RM 42.00) for bus from KLIA/KLIA2 to Ipoh is higher than total bus fare of KLIA/KLIA2 to KL and KL to Ipoh, it does not stop passengers from taking this convenient and direct bus service from KLIA/KLIA2 to Ipoh. Star Shuttle is a reliable, reputable and responsible bus company. This can be proven by their consistent and reliable bus service between KLIA/KLIA2 and Ipoh in the past 10 years. They have a strong and experienced team in the operation to ensure passengers’ smooth journey between KLIA/KLIA2 and Ipoh, so that passengers are able to catch their flight on time. BusOnlineTicket.com is the reputable online portal who provides seamless online booking service for passengers to book their bus from KLIA/KLIA2 to Ipoh.